Demand for gold has jumped almost 21 percent in the first quarter of 2016, causing some to question whether paper money is doomed and if the gold standard is due for a comeback. In their latest Liberty Report, former US Republican congressman Dr. Ron Paul and American political analyst Daniel McAdams focused their attention on the fact that the idea of reviving the gold standard has recently caught its second wind. 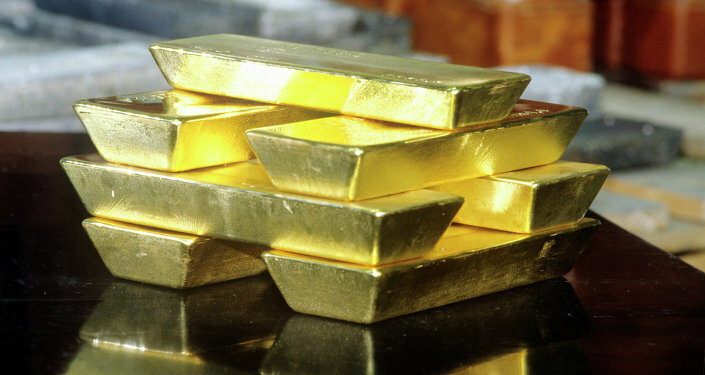 Although the US financial establishment has repeatedly attacked gold, claiming that it "is not money," the price of the precious metal has made leaps and bounds over the past sixteen years, soaring from $300 per ounce in the early 2000s to more than $1,400 an ounce. The former congressman stressed that "it is just utterly silly to say [gold] is just a commodity, and not special, no difference, and therefore it would only hurt people because how would it preserve the financial market." "If gold is money and history is correct — it's been around for six thousand years — gold wins out," Dr. Paul, who has been a torch-bearer for gold since the early 1970's, remarked. There is yet another reason to return to the gold standard, according to the former Republican congressman. "[Gold] truly is a special type of commodity and special money… I think that reason why they [US financial establishment] attack gold is gold is the restraining force [it has] on government. If you have an honest gold standard, you will restrain government — government spending, government debt, government special interests, the welfare state, the warfare state — because they can't print the money… Anyone who understands anything about monetary policy understands you just cannot create money out of thin air endlessly and think it will maintain value," Paul underscored. The experts emphasized that "the Federal Reserve and its fiat currency policy is literally the lifeblood of the warfare state." A century ago, US paper currency could be freely exchanged for gold at a guaranteed rate set by the government; this concept was known as the gold standard. From 1933 until 1971, the dollar was theoretically backed by gold, but only foreign governments could exchange US dollars for gold and private citizens couldn't buy bullion for speculative purposes. However, since 1971, the price of gold has been allowed to float and the US government doesn't back the 'fiat' money it prints with precious metal. If the Fed's endless money printing is suspended and limited by some sort of commodity-backed currency, the "warfare state," the omnipotent military industrial complex and influential Wall Street bankers will lose a big deal of their power, Paul claims. Paul and McAdams pointed out that even "gold haters" have realized that something is going on and have tried to marginalize the gold standard concept. They referred to the article "Make America Gold Again: Calls for Everyone's Favorite Standard Are Back" by Michelle Jamrisko of Bloomberg, which was published on May 17. "'The fringe has become the mainstream,' said Jesse Hurwitz, a US economist at Barclays Capital in New York. He sees the gold standard as a bad idea but 'something we'll increasingly talk about,'" the article reads. Jamrisko also quoted George Selgin, director of the Center for Monetary and Financial Alternatives at the Cato Institute in Washington, who believes that the gold standard is just a proverbial "Humpty Dumpty" that is hard to put back together. And still, "for those in the US who see much risk and little benefit in the current course, gold is still a rallying point. And their audience may be growing," Jamrisko remarked. "George Soros, who once called gold 'the ultimate bubble,' has resumed buying the precious metal after a three-year hiatus. On Monday, the billionaire investor disclosed that in the first quarter he bought 1.05 million shares in SPDR Gold Trust, the world's biggest gold exchanged-traded fund, valued at about $123.5 million," Fortune and Reuters reported Tuesday. According to financial analyst and Forbes contributor Adam Sarhan, Soros, like many other experienced investors, worries "about US stocks and a global economic slowdown." "Gold and gold stocks are one of the direct beneficiaries of the so-called 'risk-off' environment. In fact, Gold is one of the strongest performing markets in 2016 and gold stocks continue to be one of the strongest performing sectors on Wall Street," Sahran writes in his op-ed. Indeed, demand for the precious metal has jumped almost 21 percent in the first quarter of 2016. Like it or not, gold is doing pretty well. "When big legendary investors act, history shows us, it is wise to listen," Sahran adds. At the same time, Ron Paul believes that paper money, when not backed by a valuable commodity, is doomed. "Our currency became totally fiat paper money in 1971… And it's not doing well, people are panicking over it. It is rather long for paper money but I can guarantee [that] if history means anything at all, if common sense means anything at all, if economic law means anything at all the paper money will self-destruct… Eventually, you have to have a confidence restored," Dr. Paul emphasized.